Darlington House Fries were your typical fare as a reliable appetizer for the table. A’s Tri-Colore Salad with Balsamic dressing on the side was good according to her report. B’s Penne with Tomato and Basil Sauce was a clean dish approved by my vegetarian and lactose intolerant friend, while my “Skizza” with mozzarella, tomato, and basil was a good meal for a late summer evening. Overall, I’m glad I finally got to try the Darlington House considering I had lived in the same neighborhood for 3 years. It has 3 areas of dining as their website notes– pub below, outdoor (where we sat), and the upstairs indoor dining with fresh linens. 🙂 Nice date place or great place to people watch. I recommend the SKIZZAs! 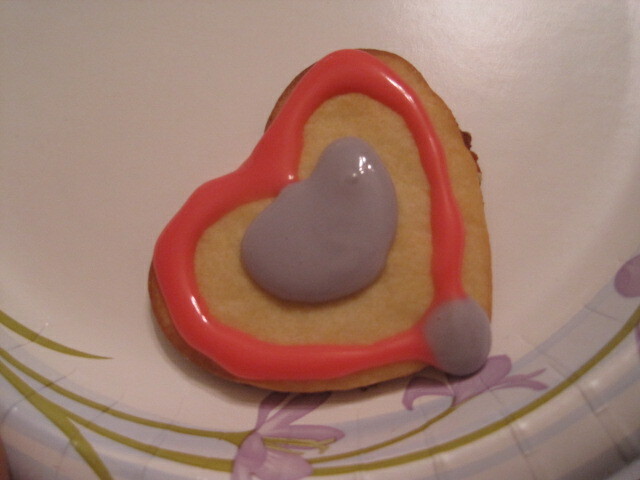 I know Valentine’s Day was 2 weeks ago, so this is long overdue. I had to at least get it in before the month was over. 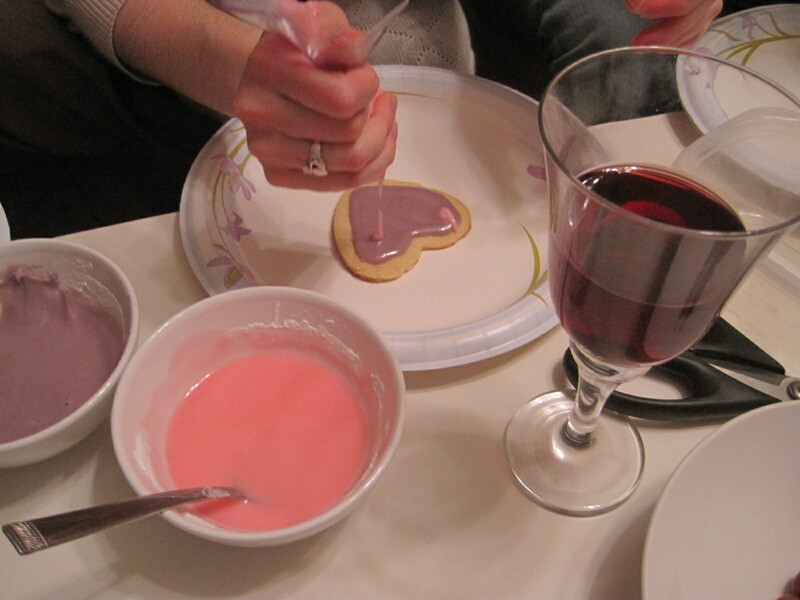 Me and my arts management ladies celebrated by doing a rom-com fest of 2 movies, a trio of pasta, and heart shaped sugar cookies. 🙂 Tada! 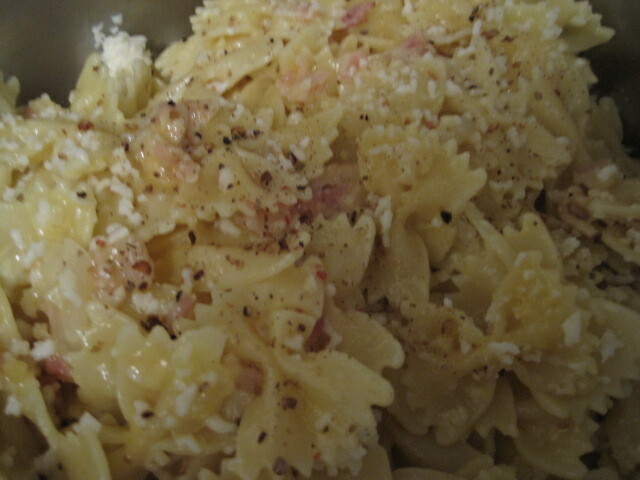 Above is my version of Paula Deene’s Pasta Carbonara. I used bowties instead of spaghetti because this is what I had. I also used organic bacon from Whole Foods instead of pancetta. 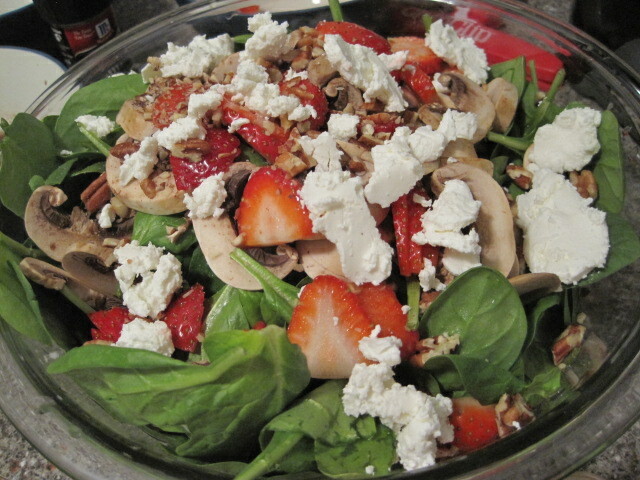 Kristin put together a delicious and fresh spinach salad with strawberries, mushroom, and goat cheese. 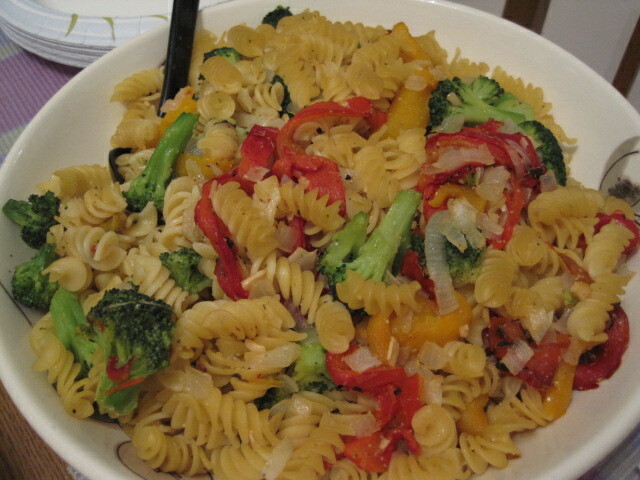 The 2nd pasta I created is a veggie medley with rotini, broccoli, fire roasted red peppers, onion, and garlic. 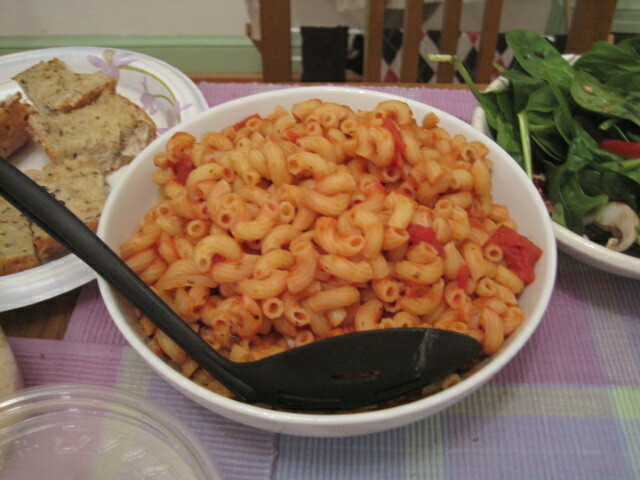 The 3rd and final pasta I made was the elbow macaroni with basil tomato sauce. 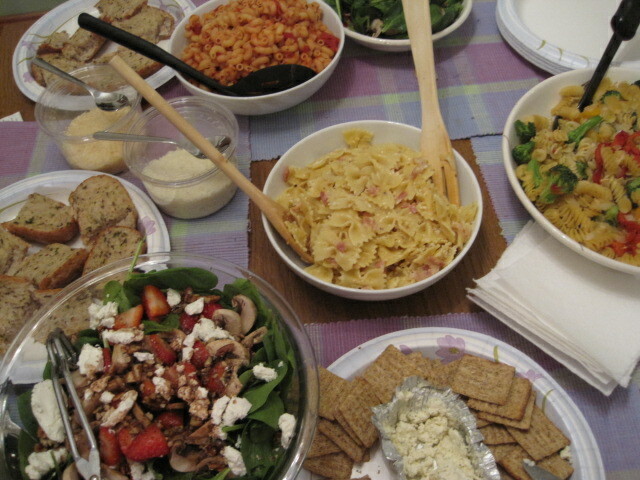 All together with Megan’s garlic bread, we had an Italian feast before our paired movies! 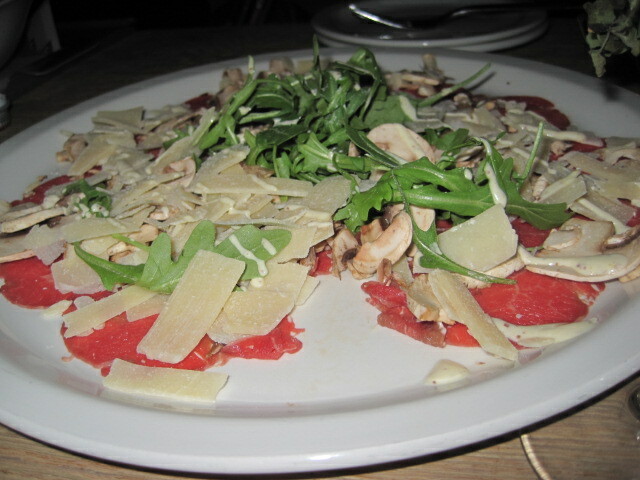 I’ve already reviewed Vapiano several times already, but my sweet Shekki decided to surprise me with a birthday dinner there. Check out my awesome martini. It’s iced with pink sugar and total sweetness within mixed with some vodka. Oh, and gummy bears buried within. 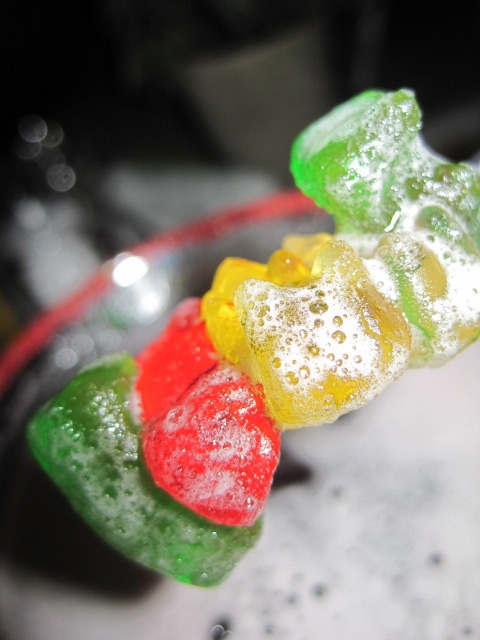 Where are the gummy bears?? There they are! Little rascals were hiding. Tut tut. I wasn’t up to chewing all of them because of the tender teeth, but willingly gave them away to friends who noted how much they soaked up the alki. Tres bon. I thought it was a very cute, strong, and girly drink. Spinach and artichoke pizza, sopressata with parmesan and basil, greek antipasti with feta, cucumber, tomatoes, and kalamata olives, and bufala mozzarella (fresh) with basil and tomatoes. Oh my, the bread they serve with all this is amazing as well. Everything is SO fresh and tasty. I truly love Vapiano. 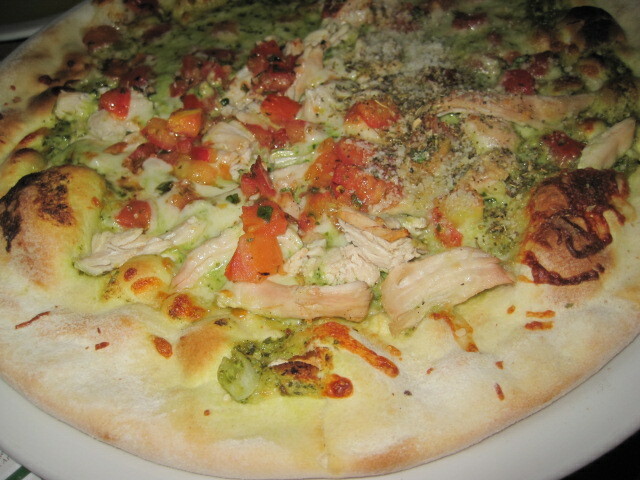 Chicken Pesto pizza. How can you ever go wrong with pesto? 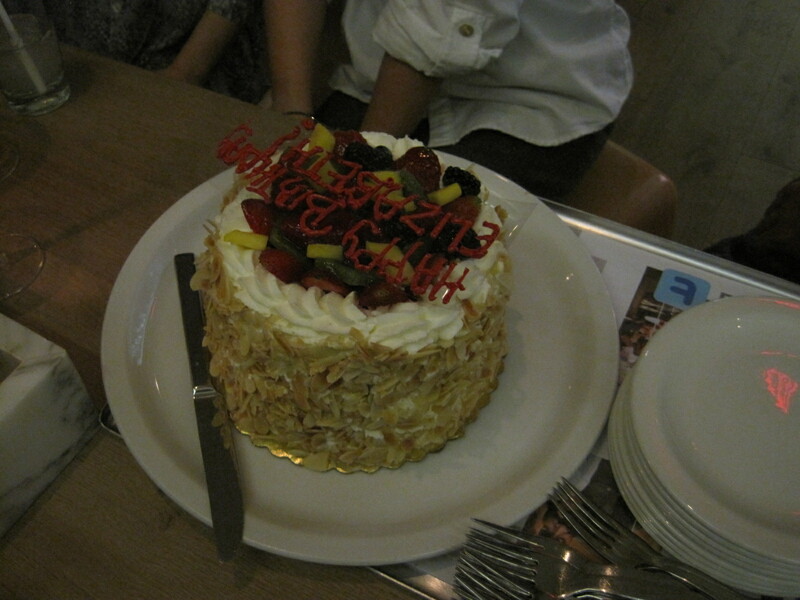 And finally, a delicious birthday fruit and cream cake from Whole Foods. It’s laced with slivered almonds. The cream is so perfect. Thanks, Den, for advising my silly man to go to WF. They didn’t have room on the cake so they iced my birthday message on a clear sheet of plastic. Nice. 🙂 This was truly a beautiful surprise for someone who was not up to planning anything for her birthday this year. I feel the love. 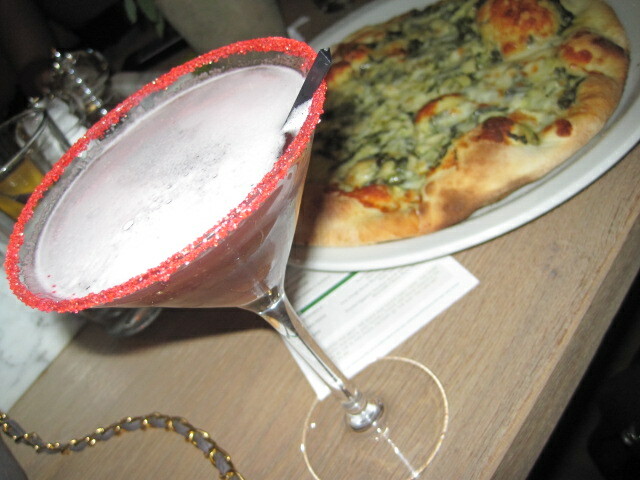 Happy Birthday to me, and cheers to my bf and beautiful friends who made a wonderful evening so special and sweet <3! AH, most importantly, Happy Anniversary to my WordPress Blog– MY ZING. One year, baby. That’s right. It’s Italian, so say it right! 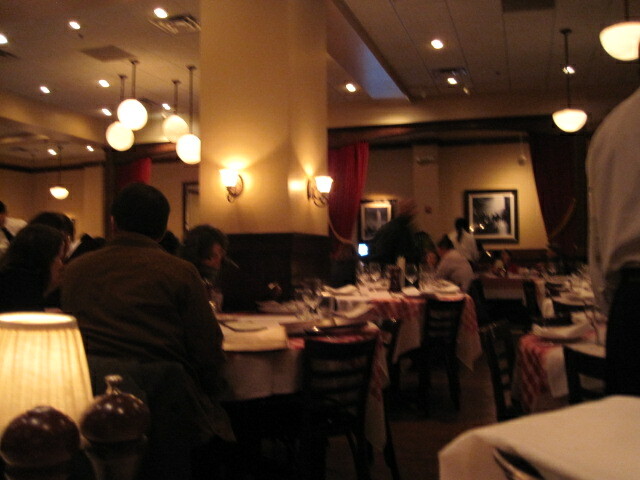 MAGGIANO’S (mah-jeeyah-nos). Dining Room view. Sorry, so dark. I don’t like using flash. It’s a fairly large and open space with large tables to accommodate large parties (family, etc.) and booth seats along the perimeter for small parties such as me and my bff. We shared a medium-bodied pinot grigio. It was refreshing! Like a taste of summer in your mouth. 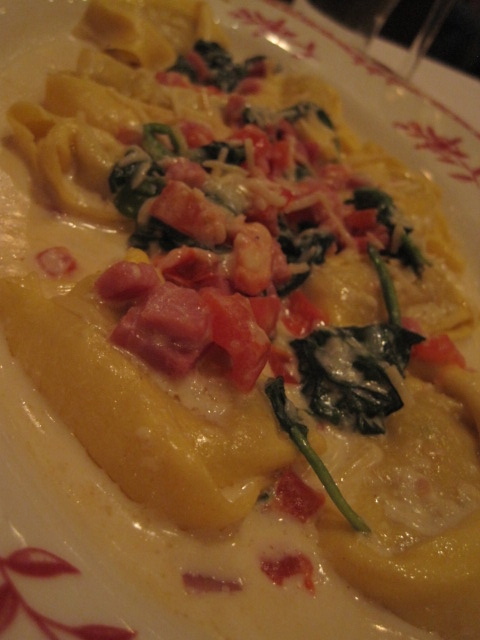 She ordered a dish I dined on my last visit: Chicken and Truffle Tortellacci, Tortellacci stuffed with chicken and baked in a garlic and white wine cream sauce w/smoked ham, Asiago, and spinach (from website). I really loved everything. 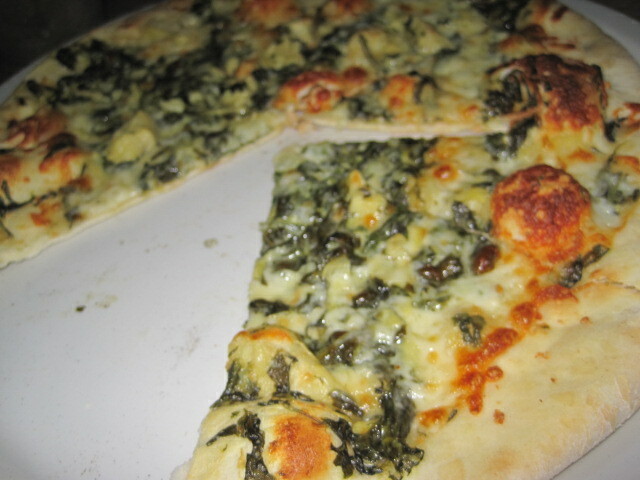 E* enjoyed her Tortellacci and especially loved the fresh spinach. 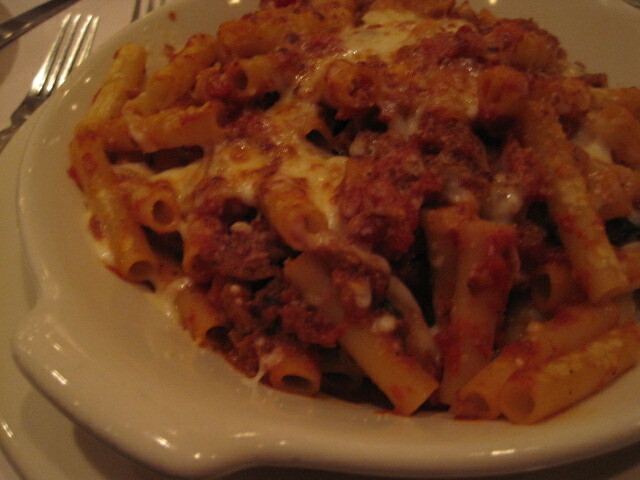 I enjoyed the baked ziti and had the pleasure of taking an additional entree home for free. 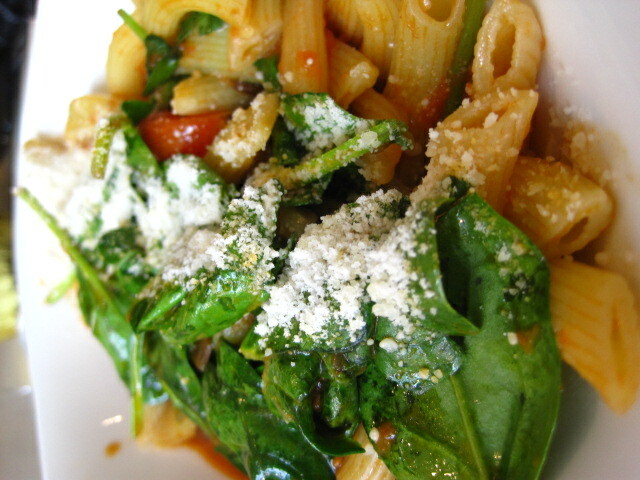 When you order one of their classic pastas, you can take another one home (different dish or same). The dessert? GREAT CHOICE. 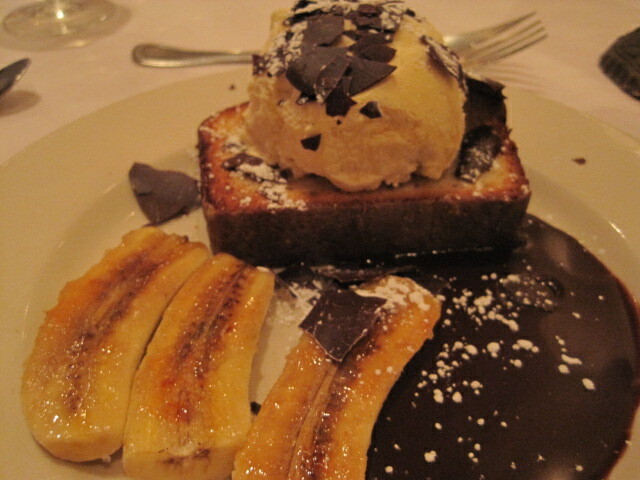 Loved the bananas, and the fudge was perfect with the poundcake and ice cream. 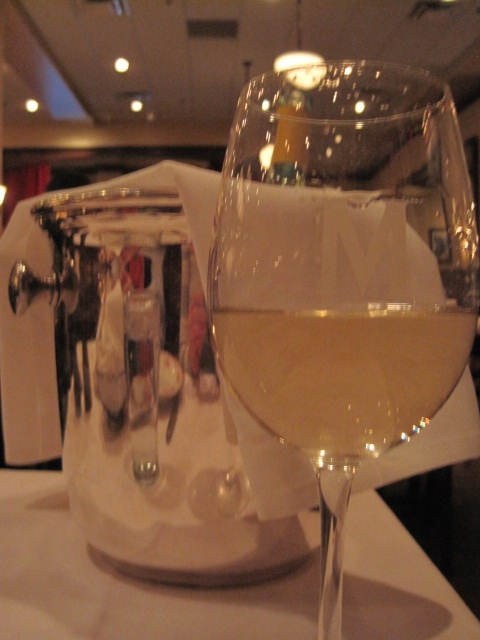 Ah, very satisfying dinner at Maggiano’s. We went to the one in Friendship Heights. There aren’t many in the DC/VA/MD area, which makes it a bit more special than other chains. I didn’t think much of this place the first time but the Bethesda location convinced me that this franchise is one of the best places to get Italian food outside of Italy. Their pizza? Crisp, chewy, good. Their pasta? Fresh, personal, tasty. Their salad? Fresh, fresh, fresh. Haven’t tried the paninis yet. The process? Walk in, grab a chip card, go to whatever station (pasta, pizza, salad) order whatever to your liking, they scan the card, you can go to the bar to order whatever drink, scan again, go back for dessert, scan again, or not. Whatever. Basta. 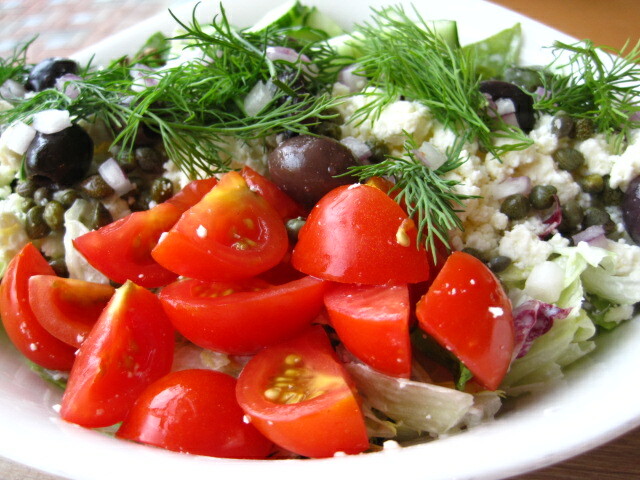 large greek salad. 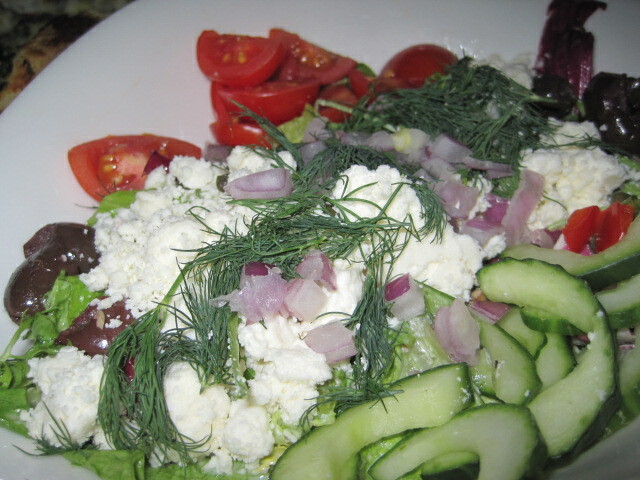 mia mamma did not appreciate the saltiness of the feta and capers and olives all together. me? 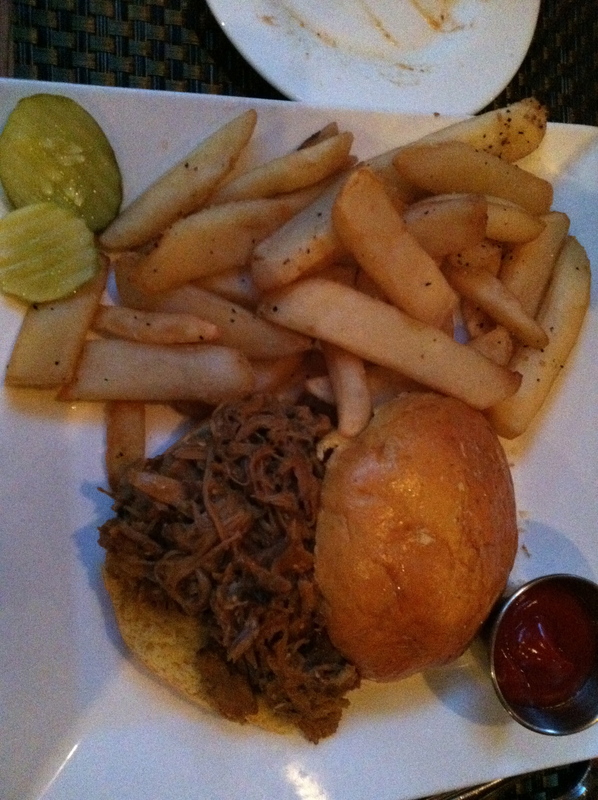 i didn’t mind that much, especially with the soft rolls they offer you. 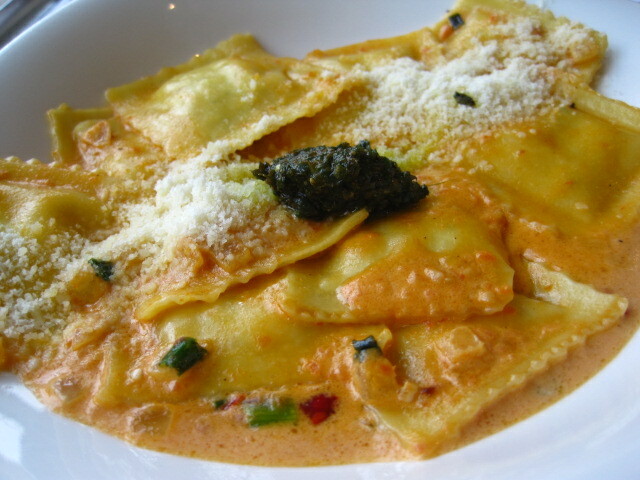 Four cheese ravioli. I like this quite a bit. They don’t give you too much, the sauce is pretty good, not as overpowering as most cream sauces, and they top it off with a dab of pesto, which I don’t actually think is necessary. With a spicy kick, this dish was perfect for my taste. All in all, I really like Vapiano. 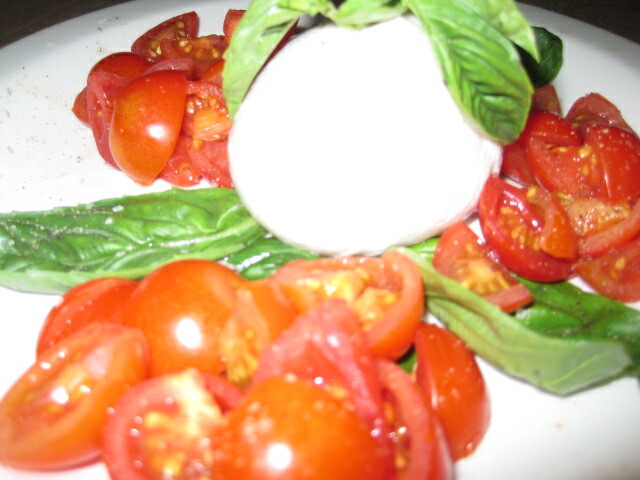 They provide you with fresh LIVE herbs which you can pick at your pleasing at your table. It’s a wonderful atmosphere and great for after work drinks, but really works for any type of gathering and any time of the day.